Beveridge Bridge San Saba River Texas Suspension Bridge. 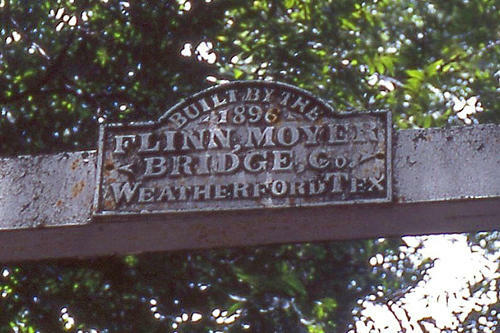 The Beveridge Bridge proudly bears its makers plaque atop the crossbeam: "Built by the Flinn, Moyer Bridge Co.,Weatherford Tex 1896". Crossing the San Saba River just north of the city of San Saba, this single lane, parallel wire suspension bridge is 140' long with a wood deck supported by three-pole pylons, iron pipes, rods and castings. Although it had been rebuilt at least three times over the last century, it was closed to vehicle traffic in 2004 and a new concrete bridge was built beside it. 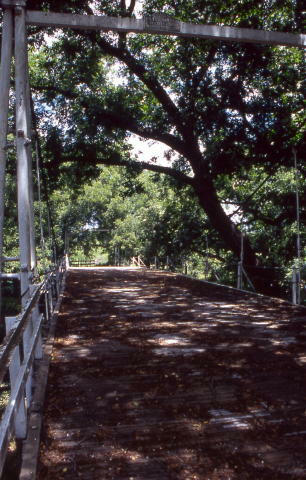 The nearby Regency Bridge is now the only suspension bridge in Texas still open to vehicle traffic. Restoration of this picturesque old bridge, to begin in November of 2005, will be managed by the Texas Dept. of Transportation, Historic Bridge Preservation Program. The work will include new concrete foundations, cables, wood deck and paint. When finished, it will be open to pedestrian traffic only. The anticipated reopening is summer, 2006. John H. Beveridge established the first crossing of the San Saba River at this location for the transportation of local crops to market. 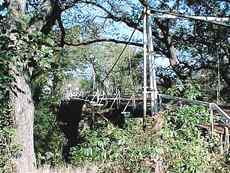 The bridge, which crosses the San Saba River just outside of town, is one of only two suspension bridges, in the state of Texas, that are still used by cars and trucks. Named for John H. Beveridge, who established the first crossing at this location for the transport of local crops in to town. Has the trademark Flinn-Moyer tripod towers with cast-iron saddles supporting cables of galvanized wire. The towers are linked together by a series of smaller pipes creating an interesting visual effect. Photographer Gibson provided this tip: "The Wedding Oak is right up (down) the road of the Beveridge Suspension Bridge near San Saba. If you've been to the bridge, you've passed under this tree."